Achieved meeting various designs and high quality finishing. The back stroke supports the back of a shirt. ・Supporting the back is made by pulling down the pinched skirt of the back. 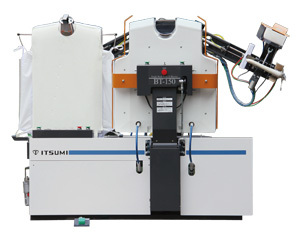 ・Finishing process is made by enhanced vacuum capability after stretching pleats straightly. ・Time to place a shirt is remarkably reduced, and load to an operator is lowered as well. Arm angle adjustor makes it possible to meet the latest fashion. ・Possible to meet diversified shirt designs and the latest fashion. ・Possible to meet finishing an edge of a uniform in addition to a shirt. halt an operation at an arbitrary spot. ・Achieved a long life with fusion of simple neat design and robust structure. ・It is easy for everyone to replace the pad and cover and the airbag.